TAVTI was formed in 1975 by a group of law enforcement officers from Texas concerned with the rising volume of vehicle thefts and the associated financial loss. They formed an organization dedicated to addressing the crime of vehicle theft. Soon thereafter, the by-laws were adopted and the State of Texas established a charter for TAVTI. Since its formation, TAVTI has demonstrated the most effective weapon to combat auto theft, and associated crimes, is cooperation. Auto theft continues to be one of the most complex, costly and widespread crimes to confront law enforcement and citizens throughout the United States, and TAVTI's efforts have been increased accordingly. In 1976, TAVTI sponsored legislation requiring salvage yards to keep records. In 1977, they called for the standardization of confidential vehicle identification numbers (CVINS). In 1991, TAVTI sponsored the creation of the Texas Automobile Theft Prevention Authority (ATPA), which is now the Texas Auto Burglary and Theft Prevention Authority (ABTPA). This program has allowed the state to fund auto theft investigative task forces throughout Texas. 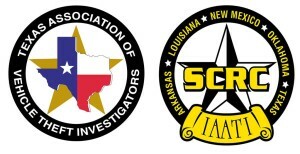 TAVTI opened its membership doors to law enforcement, the insurance industry, and four other charter states: Oklahoma, Louisiana, New Mexico and Arkansas. In 1999, TAVTI voted to become a member of IAATI and was established as the association's South Central Regional Chapter, which brings the above-mentioned states together in one unified entity. A regional director represents each of the charter states as well as regions within Texas. Members have the opportunity to come together during TAVTI's week-long educational seminar and business meeting held in the fall of each year. This conference provides many hours of classroom training and instruction to enable members to stay abreast of the ever-changing dynamics associated with vehicle theft. This event brings together a world-wide network of information and assistance to our members. Members also enjoy training opportunities throughout the year as well as regular auto theft information mailings and updates, excellent statewide networking, and the quarterly SlamHammer membership magazine. If you have questions about this website, please contact Michelle Lanham at 817-291-7208 or tavtiscrc@gmail.com. If you have questions about TAVTI/SCRC membership or the annual conference, please contact SCRC Treasurer Kat Anderson at 806-787-5133 or texkat52@yahoo.com or Michelle Snyder at 254-757-0701 or adminattf@burnetcountytexas.org.